By Amanda Tan Straits Times 2 Mar 11. THE Land Transport Authority’s (LTA) decision to build a road in Clementi has ruffled the feathers of nature lovers living in the area. Work has started on the 1km road aimed at easing congestion along Jalan Lempeng, which connects to Clementi Avenue 6. 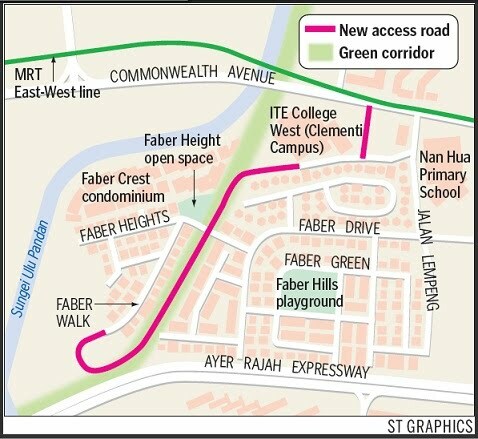 The new road, which gives a direct link to Commonwealth Avenue West, will cut through an area of greenery where residents said wild birds such as the long-tailed parakeet and Tanimbar Corella are regularly sighted. I grew up in Jalan Lempeng and it is really sad to read news like this. I remember playing in what was then a wooded area (it is now a condo) and waiting at the bridge to see trains passing by. After the train service was discontinued, vegetation took over and trees sprouted and ended up covering the tracks. Those trees that are about to be fell (have they been chopped already?) took decades to reach their current size. LTA and NP’s initiative to ‘replace’ or ‘replant’ them simply don’t make any sense. Not to mention the loss of habitat for the fauna that depended on the trees. That is something irreplaceable. And to Mr. Gerald Yong(28). Your ‘pain’ can be remedied by leaving your house 3mins earlier. Is 3 mins of your time worth more than the green lung in your neighbourhood? Thanks yuli for sharing! Think the trees should be still there unless LTA starts the road construction again.